What makes the perfect summer album? For me it needs to be something peppy, bright, fun, and easily digestible. Waiting for the Dawn, the new album from California 8-piece The Mowgli's, checks all of those boxes and more. From the opening notes of the jangly, hook-heavy "San Francisco", you can tell that you're in for a delightful pop ride. It's hard to pick out a track that isn't instantly catchy, with many of them forcing you to sing along even before you are familiar with the lyrics. The band's energy, at its height on "Slowly, Slowly", is infectious. If that's infectious, then the airy whistler "Clean Light" threatens a contagion outbreak. That energy is aimed in the roots rock direction on "Time", which has a tinge of Mumford & Sons to it. A recurring element is the multiple voices singing both the verses and the choruses. 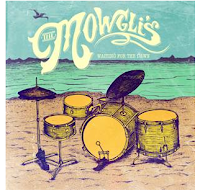 The Mowgli's use this over and over on tunes like "The Great Divide", "Leave It Up To Me", "Say It, Just Say It", and the title track. The technique evoke (positive) comparisons to indie pop outfits like Los Campesinos! and Regina's own Library Voices. The male/female vocal interplay on "Love Is Easy" may be even better. It has a tension to it that's half tug-of-war for control, and half playful roll in the hay. Waiting for the Dawn is such a good record that it almost dares you to dislike it. You need a cold cold heart not to melt for this album. You'll be begging for more. The Mowgli's play the Mod Club in Toronto on July 2nd. Best tracks: "San Francisco", "Love Is Easy"